As technology changes and evolves, so do our reading habits. While this age-old pastime used to mean trips to the library or bookstore, devices like smartphones and tablets have made reading a digital habit, one that's accessible to virtually anyone, anywhere. Apps have especially influenced this new reading experience, thanks to capabilities that cater to the individual reader and put the entire experience in the palm of a hand. 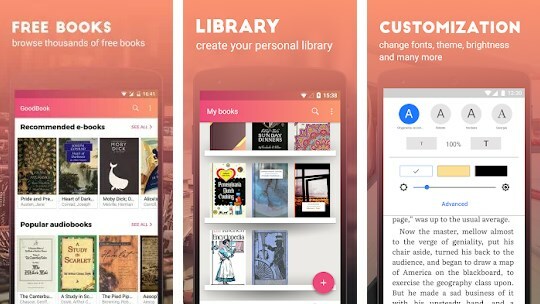 We've reviewed one of our favorite book and reading apps for Android - GoodBook. The best part is it’s totally free — and guaranteed to be the new obsession of every bookworm out there. GoodBook is here to provide users with their favorite books. If you want to read anywhere and anytime, this amazing app has got you covered. Offering thousands of free ebooks right at the tip of your fingertips, this app is designed with neat and friendly user interface and has many features that will enhance your reading experience. Let’s talk more about these features. GoodBook is source of thousands of free books from public domain. You can easily browse for your favorite books, from many famous authors, like Joseph Conrad, Oscar Wilde, Jane Austen, Charles Dickens, etc. You can easily find anything you like – just enter the book or author you’re looking for in the Search bar or search by category. Then open the book and start reading it – it’s that simple. . You can also import books from your phone memory. GoodBook lets you read your books even if you’re not connected to the Internet. It allows you to create your own book library, to add bookmarks with different colors, to customize the font size, style, background, margins, night mode, and so on. Choose your best style for reading, listen ebooks like audiobooks if you want, check the meaning of words that you do not understand or translate them, read all books in a more convenient and simpler way. You can download the GoodBook app for free from the following Google Play link. Get it now and enjoy!